Red 16 litre plastic bucket with ‘FIRE’ printed across the exterior wall. 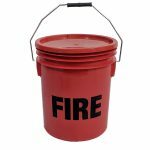 These plastic fire buckets are larger than others available online. They are also manufactured to H&O Plastics’ heavy duty specifications, and sturdier than other fire buckets. These large plastic fire buckets are suitable for tackling small blazes before they have a chance to develop. If filled with sand or specialist fire suppressant material, they can also be used to tackle or stem the flow of liquid fires. Plastic fire buckets are also useful on campsites and in caravans, where fires can start quickly and cross over to other structures easily. These fire buckets are light and easy to handle, which is vital in an emergency situation. They are also resistant to corrosion, and cheaper than other fire buckets available online or in specialist fire shops. Red fire buckets with lids. These buckets are designed to stand out in an emergency situation. Each bucket comes with a friction shut lid to prevent improper use (for example being used as ashtrays). At 16 litres, the fire buckets will typically hold 25kg of sand. H&O Plastics manufactures and delivers plastic fire buckets. Buying online direct from the manufacturer means that you can cut out the middle-man and enjoy significant cost savings on our range of high quality plastic buckets.